Coming out of last night’s gripping, edge-of-your-seat finale for The Walking Dead, fans were left with a bevy of questions to mull over ahead of season 9. But if there’s one ‘loose end’ that left some viewers yelling at their television sets, it’s Rick’s decision to ultimately spare Negan (Jeffrey Dean Morgan) just before the credits rolled. 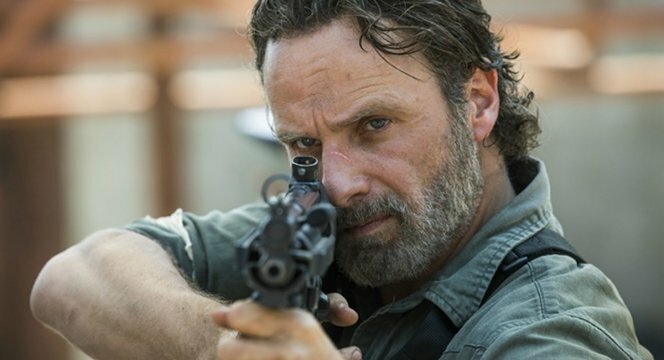 It’s a question that was presented to Rick Grimes himself, Andrew Lincoln, on the most recent installment of Talking Dead, where “Wrath” was picked apart and analyzed for all to see. In the end, season 8 of The Walking Dead was the story of Rick and Carl’s father-son relationship, which goes some way to explaining why restraint ultimately prevailed over revenge. I think we’re telling a story about restraint rather than revenge. We’re telling a story about a love between a father and a son not a hatred between two old men and I think it’s that simple. It’s self-explanatory. It’s in the episode. Not that we can say we didn’t see it coming; all throughout The Walking Dead season 8, it was implied that Rick Grimes would allow Negan to walk, as killing someone isn’t necessarily in his blood. There are many leading up to it, of course. Daryl’s trying to get him to open up at the grave site, Michonne encouraging him to read the letter, then there’s Morgan pulling out after the massacre in Episode 8×14, when he says, ‘Why did you save me? Your son was there.’ ‘Because my son was there,’ he says is why. I think Rick realizes in these points of darkness and trauma and grief, killing ain’t gonna take the pain away. Revenge isn’t gonna do it. When he slits his throat and he says, ‘The boy didn’t know a damn thing, there’s that common knowledge that Negan says he’s appalled. He says, ‘You just used your son’s name in order to kill me!’ And he recognizes himself in Rick’s actions and it’s only at that point that Rick realizes how far he’s gone and where he’s headed if he continues that way. And that’s just it: last night’s finale of The Walking Dead had all the makings and resolution of a series finale, so it’s small wonder why AMC creators are beginning to champion the in-development season 9 as a totally different show. Or, at the very least, a blank slate.